1. All Daytime classes start promptly at 0900 hours. All Night classes start promptly at 1900 hours. 2. Each participant will receive, upon entry, a sign-in card. Please print legibly. The Academy is not responsible to give credit to individuals with indecipherable information. 3. Completed sign-in cards will be handed in at the conclusion of the training. ALL students are required to remain for the duration of the training. 4. Only ONE card will be permitted to be handed in per student. No one will be permitted to hand in cards for others. Anyone attempting to hand in a card for another member(s) will result in no credit given to members not present at end. 5. Members that cannot attend with their Department are welcome to attend any other session, capacity-willing. Those members must contact the Academy office via email (smaloney@mcfmnj.org) or by phone to ascertain which sites have openings. 6. 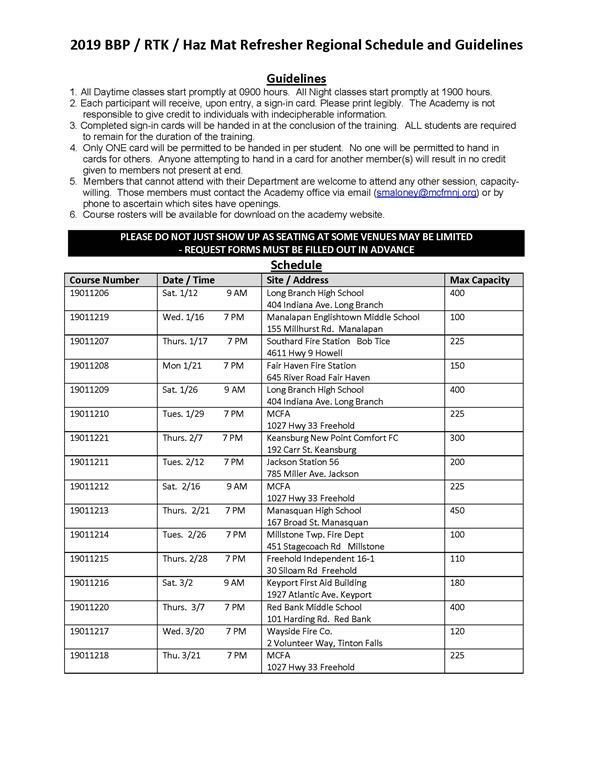 Course rosters will be available for download on the academy website. PLEASE DO NOT JUST SHOW UP.